Believe it or not, it’s 30 years since the birth of acid house. Described as “the second summer of love”, Britain discovered house music, the drug ecstasy & a love of partying illegally in fields & warehouses. 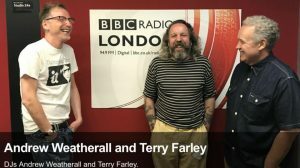 In order to discuss those heady days and delve into London’s role in that emerging sub-culture, Gary Crowley invited Andrew Weatherall and Terry Farley on to his “My London” show on BBC Radio London last Saturday. The Boys Own cohorts reminisce about their first meeting, beloved hard to find records & clothes, clubland then (and now) whilst playing some of the tunes that evoke some poignant London memories. Well worth a listen back on the BBC iPlayer.